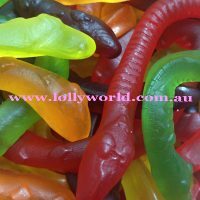 Allens Snake Lollies are definitely on the classic lolly list. The Allens Snakes are packed with a random mix of natural colours in each bag with delicious natural fruity flavours. Chew them and stretch them as long as you can. These will always be a favourite at your party or function.